By his own admission, Red Sox prospect Trey Ball's offseason work as a hitter amounted to "none at all" after being selected with the No. 7 overall pick in the 2013 First-Year Player Draft. So, it was no surprise that in his first at-bat as a professional -- five years removed from his last as an amateur -- against Binghamton's Franklyn Kilome in September, the 24-year-old was overmatched by the Mets No. 3 prospect. "I had fun with it. Obviously, I was a little nervous getting in the box for the first time in five years," Ball said with vivid memories of Kilome's mid-to-upper 90s fastball in that first bout, which did not come with a happy ending. "I got 1-2, and then he threw me a back-foot slider and I was like, 'Oh God, I'm not ready for that.'" After impressing scouts on the mound and at the plate in high school, the New Castle, Indiana, native entered the Draft with even more uncertainty than most of his counterparts. Boston decided the best path to the Majors for the 6-foot-6 left-hander would be as a pitcher. "Whatever the team wanted me to do, I'm all for it," Ball said. "Of course, coming out of high school, everyone wants to do both if they're doing both. Five or six years ago, that wasn't the case." Ball went from Indiana Baseball Player of the Year to a tumultuous tenure as a pitcher in the Red Sox system. He posted a 3.84 ERA with Class A Advanced Salem during his second year at that level in 2016, his best mark by nearly a full run in 75 professional starts. A shift to the bullpen seemed to make sense after he went 7-12 with a 5.27 ERA and 103 strikeouts over 124 2/3 frames for Double-A Portland in 2017, but his numbers continued to slide. The lanky southpaw pitched to a 5.98 first-half ERA over 43 2/3 innings, and although he notched nearly a strikeout per inning (43), he was unable to convert any of his three save opportunities. 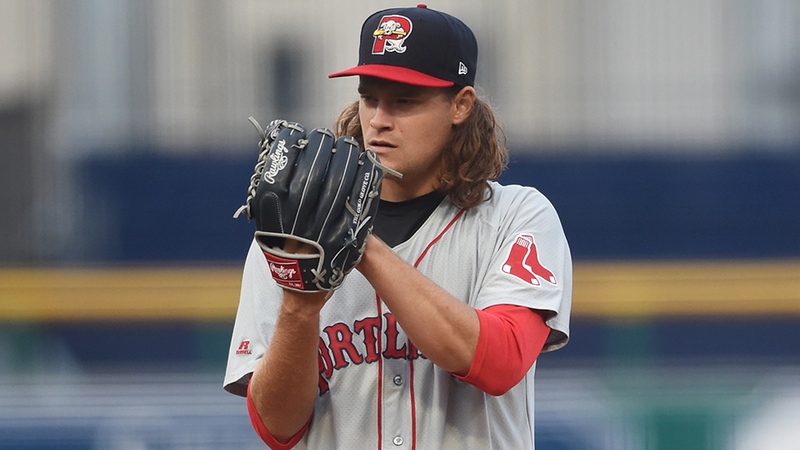 During a routine visit with the Double-A club in June, the Red Sox brass, headed by vice president of player development Ben Crockett approached Ball with a new assignment, contributing to a developing trend in baseball. Crockett noticed the change in the game and told Ball that he saw value in a player than can contribute both as a hitter and a pitcher. Ball began taking on-field batting practice after the All-Star break through the end of the season. "I think the main focus right now is outfield and hitting," Ball said. "I think the pitching side, I would be the guy to come in every few days. Little extended time off on the pitching side and a little more outfield and hitting." Ball got one hit in nine at-bats over the final two games of the season, a go-ahead double in the seventh inning of his first game against Kilome, a day removed from his final pitching appearance of 2018. He finished the season with a 7.58 ERA and 56 strikeouts over 65 1/3 innings. "It comes down to consistency," Ball said of his pitching woes. "There's games that I can go out there and shut everybody down, and there's games where I can't get out of an inning. … Being able to mix things up and keep hitters off-balance and not get to a set routine. "I just wasn't able to stay consistent." Following the season, Ball was available in the Rule 5 Draft but was not selected. By remaining with the Red Sox, he was able to take his next steps toward becoming a two-way player. He jumped back into a position that he'd left behind five years ago in the instructional league, playing mostly left field while gaining invaluable experience getting at-bats against live pitching. In past offseasons, Ball would return to New Castle High School just as the fall baseball season started. He would go to one practice, participate in a few rounds of batting practice, then put his bat into hibernation. Angels outfielder Shohei Ohtani and Rays second-ranked prospect Brendan McKay have blazed a trail for two-way players over the past few seasons. Ohtani was named American League Rookie of the Year in his first campaign stateside, and McKay has continued the play that earned him three John Olerud Awards - an annual prize given to the best collegiate two-way player - to the Florida State League. Ball knows what he has to follow. "Just seeing that and being able to use different athletic abilities for pitching and hitting … that allows you to open up and be a better and complete athlete," he said. "I think that'll definitely come into play." The lefty-swinging Ball is now listed at 185 pounds, much sturdier than he was five years ago. His new offseason workouts put an emphasis on upper-body strength, and he's gained confidence in his timing at the plate, but his biggest hurdle isn't physical. "Getting my eyes back," Ball explained. "I feel my body can time it up, it's just seeing with my eyes. I've really been focused on that this offseason." Ball described a drill that involves setting up a pitching machine in a batting cage roughly 40 or 50 feet in length. He places three different plates in a line separated by four feet. Without picking up a bat, Ball will map and chart the speeds of the pitches, simply tracking the ball at all three plates to work on his timing and get his eyes to see the ball. Extended work like this is in store for Ball in the days ahead. He's already looking forward to an early spring schedule, taking batting and fielding practice before the pitchers begin their stretches. With McKay, the Rays decided to mirror his old schedule from the University of Louisville. Ball does not have that luxury. "I think [the schedule] will be something to transition to for sure. I think going to instructs really helped me adapt to that," Ball said. "My goal right now is to just focus on the hitting, go down to spring ready to hit and show them what I've got and put the ball in their court." Though he has struggled as a professional, Ball has only moved up the organizational ladder after repeating tours in the Carolina and Eastern Leagues. He's now back in audition mode, unsure of where he will start the season. "I think just [the Red Sox] opening up the opportunity for me to swing a bat again and get to the outfield, that's big," he said. "Obviously, my struggles with pitching the last few years have been there. I think them coming to me and allowing me do this and try this is really an opportunity for me, and I'm going to take advantage of it."